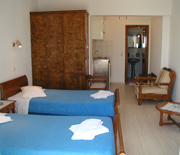 Eleni's studios is a complex of fully equipped and furnished rooms a few steps from Ornos Beach. Ornos is an organized beach with umbrellas, sunbeds, taverns, coffee houses and tourist shops. Despite its proximity to the center (3km) it is ideal for tranquil vacations in a relaxed atmosphere. The rooms are sunlit with traditional furniture, a private bathroom, satellite TV, A/C, Mini bar and kitchenette in order to make your stay more comfortable. Daily maid service is at your disposal. There are family rooms too. The management of Eleni's Studios can arrange your transportations from/to the hotel and sightseeing tours all around Mykonos. There is a parking space available to all guests. Pets allowed. Credit cards accepted. THE ABOVE DAILY RATES ARE IN EUROS (€) AND INCLUDE ONLY ACCOMMODATION AND TAXES.